At Sussex Eye Center, we promise wonderful service by building relationships in a caring and friendly atmosphere. Our team of eye doctors and staff provide quality eye care through continued education, advanced technology, and eye wear you can count on! Our team treats you like family, because you matter to us! We have proudly been providing eye care in Southern Delaware for over 30 years. Since first opening in Georgetown in 1983, Sussex Eye Center has further expanded with locations Lewes, Long Neck, and Selbyville. If you live in southern Delaware, we are never far from home. We happily participate with most major medical and vision insurances including Medicare, Eyemed, and VSP to keep your costs down. 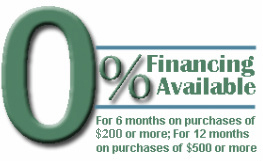 Also, our terrific payment plan options through CareCredit enable you to purchase the highest quality products on the market with zero interest financing.